Pismo has been a getaway place for our family for a number of years. When our children were in their teens we used to go camping at Pismo Dunes RV park or Pismo Dunes State Beach. For the past five years we have had our trailer permanently stored in Pismo, and whenever we want to go down we make a reservation at the Pismo Dunes RV park. It usually takes a six month in advance reservation to make that a week in summer. We try to go down several times a year especially during the hot months. This past August we had a full week and were joined by our Son Colin and his new wife Maria. They flew out from Virginia to be with us on Cindy's birthday. That was her present this year. Having our son and his wife with us made the week special. It is a cool respite from summers heat inland, and its beaches are a source of wonder from morning to night. Waking early in the morning and making a fresh pot of coffee always sets the day off the right way. It is usually col and foggy in the early hours, and a perfect time to walk up on the top of the barrier dune and survey the lagoon that is usually filled with both sea birds and marsh dwellers. It is relaxing to enjoy the antics of the duck's bobbing up and down for breakfast on the bottom of the lagoon, or see pelicans dive down and grab a snack of fresh fish. Shore birds such as the Great White Egret and the Lesser Egret, as well as Blue Herons wade along the marshy sides spearing anything that comes within reach. Cormorants sit on floating logs washed down by winters rains, spreading their wings to dry them in the air. It is a bird sanctuary, a natural wonder of natures bounty for beach lovers and birders to enjoy. I got up early as I have many times, only this time I took my sketch book along with my cup of coffee, and began drawing some notans for a painting of the lagoon with the somber morning fog. I decided on a painting, and went back to the campsite to break out my pastels. I began that painting while I had the low natural light and also took a few photos so I could have the right lighting in case the weather changed before I finished. I did end up finishing that painting at home sitting on our deck a week later. Since my Colin and Maria were with us and it was her first time to California, there was not a lot of time to just sit and ponder the beauty and sketch or paint. We did need to show her the area and some of the beautiful places that are so near. I did take quite a few photos though, and one special evening my son and his wife and I all sat on the top of the dune, overlooking the lagoon, and watched the sun go down. It was a beautiful evening, with wonderful clouds and lots of color. Unfortunately my camera battery died at the time when the sun was providing such a beautiful palette of color. Fortunately my son reminded me I still had a camera in my I-Phone and I took several pictures of the beautiful twilight sunset that dappled the sand and lagoon in pinks, and shades of purple. The light was mesmerizing and very beautiful. I wanted to paint this wonderful scene. I sent them to my Gmail address so I could look at them on my computer. With family emergencies requiring several trips south and a full calendar of work for my old employer, it was not possible to paint that scene until this month. I selected a piece of Kitty Wallis Belgian sanded paper that was 12" X 18" and taped it to a board and placed it on my easel. I began the painting with a sketch of the lagoon, and then used Prismacolor pastels to block in the different color masses. Once I had that done, I brushed the colored areas with Turpenoid to provide a good base. I followed up with soft pastels from my palette of Rembrands, Sennelier, Winsor and Newton and Great American Art pastels. The painting gradually came to life on my easel but the lighting in the room I use as a studio is terrible. When I took the painting outside to get a sense of the balance and color, I was disappointed, and not at all happy with the way it looked. The colors were just not right at all. The warmth was not there. Today, there was no rain and it was bright and a cool 51 degrees. Since there was a breeze, I decided to put on a warm coat and I took my table top easel outside and put it on the patio table. It was there on the deck in natural light that I finished the painting. The light on this cloudy day allowed me to get the right hues on the sand and capture the reflections in the water. 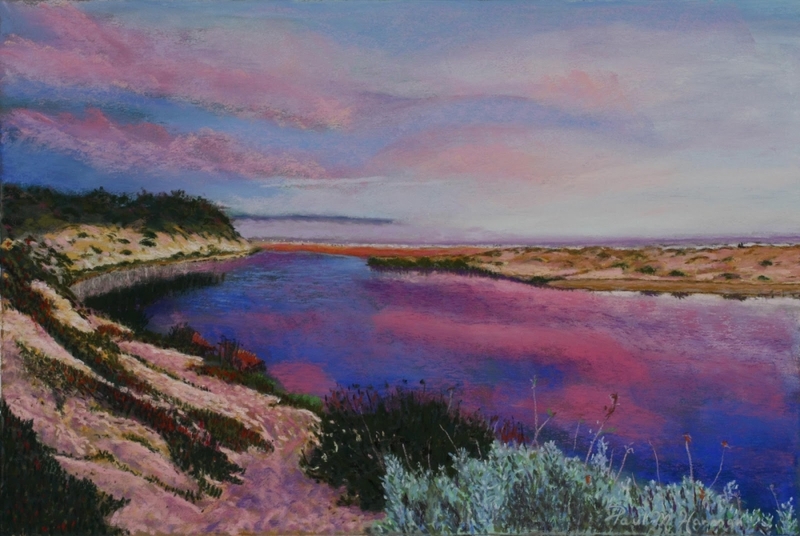 I hope you enjoy the final product which is called, "Twilight on Pismo Lagoon".